“Cyclists are everywhere these days”, right? Termed ‘the unstoppable rise of cycling’, more of us than ever are taking our wheels for a spin to get from A to B. Unless you are unlucky enough to have a fall whilst out for a pedal, cycling is also one of the best sports you can do for your well-being. 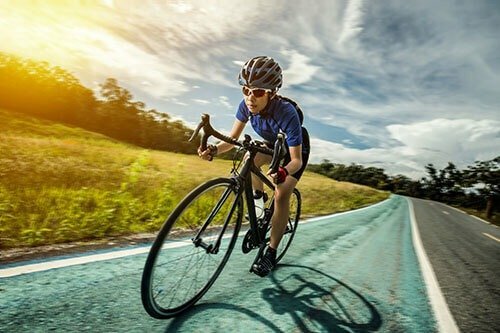 Good for your brain, your heart and your bodily health in general, recent research conducted by the British Medical Journal has found that cycling regularly can significantly lower the risk of many serious illnesses, such as heart disease, source bmj.com. However, as with all endurance sports, occasionally you can sometimes end up with a ‘pain here’ or a ‘niggling ache’ there. 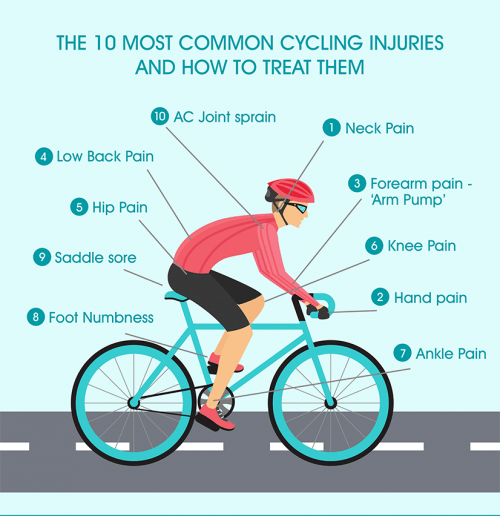 If not managed properly by a medical professional, these cycling injuries can develop into longer term problems that could slow you down and even stop you cycling. We Osteopaths at bodytonic clinic want to keep you pedalling. 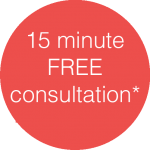 Manual therapy can pro-vide an easy solution to your issues, keeping you on the roads while shedding light on the reasons behind your injuries and giving you simple ways to prevent them from happening again. 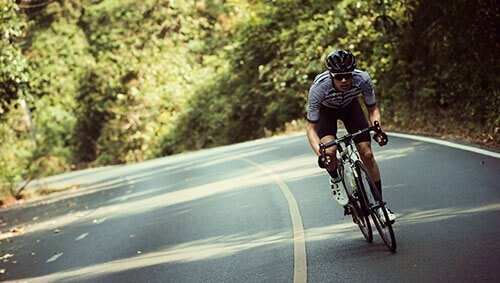 As a starter for ten, here’s a round up of the most common cycling injuries, what causes them, and what you can do about it. Symptoms: Pain and ache in neck, can radiate to middle part of the back. Rotating and bending your head can be difficult, making it feel ‘blocked’. Common Causes: One of the most common complaints for any cycling discipline, it is of-ten the result of reduced flexibility in the upper back or neck with poor adaptation to sus-tained posture. Your spine is one of the strongest parts of your body, but it can be very sensitive when over-strained leading to a painful muscle spasm. Muscles like to be active and moving, so holding a static position you aren’t familiar with or for longer than you are used to can make them painful and stiff. What you can do: Gentle neck stretches can help loosen your neck and get it moving more freely. An Osteopath can then help with hands on treatment to mobilise your neck and tai-lor exercises to get it back to normal. Symptoms: Pain, which can be accompanied with weakness and pins and needles, in your ring finger and little finger. Common Causes: Irritation of a nerve which passes on the underside of your wrist, known in medical terms as ‘ulnar neuropathy’. Commonly caused by holding handlebars in one position for too long, this can be associated with restriction in the forearm muscles and wrist joints. What you can do: Try altering your grip position more frequently when out riding to prevent the buildup of tension. If things don’t improve, an Osteopath can help to increase the mobil-ity of your wrist and elbow to reduce any tension on your nerve.They can also advise you on looking into a new set of grips. Symptoms: The nemesis of every downhill or bike park rider, an intense ache in the fore-arm that hits at the end of a lap and can make ‘un-gripping’ your hands difficult. Common Cause: Tired, tight forearm muscles. What you can do: To start, consider altering the rotation on your handlebars or brake lever angle, so the wrist is in line with the arm when standing on the bike. Including some post ride stretching into your routine and Osteopathic treatment to help function of your elbow and wrists will also help too. Symptoms: A sharp pain or ache in the lower part of the back, which can radiate to the buttock and thighs. Can be accompanied with a feeling of stiffness when getting up from sitting. Common Causes: Another very common condition affecting up to 60% of all cyclists at some point. Low back pain is often the result of sustained posture with decreased flexibility in the hips. As the low back is relatively fixed when sitting on the saddle in order to en-courage efficient power transfer through the hip, this can lead to a strain in the lower back muscles. Having a desk job can also not be helpful, as it can reduce the flexibility in your back if you don’t have regular stretches to keep supple. What you can do: Check the angle of your saddle isn’t too low or tipped up first. Lower back and hip stretches can relieve tension in the muscles and Osteopathic hands on treat-ment can help with encourage better movement in your low back and hips. Your Osteopath can then help you to tailor exercises to prevent re-occurrence of this problem. Symptoms: Pain at the front and outer side of the hip, can travel down the thigh towards the knee cap. Common Causes: Tightness in muscles at the front of the hip (known as the hip flexors) from prolonged sitting (either cycling or at work) can lead to decreased flexibility and be linked with irritation of bursa located at the front of the hip (these are fluid filled sacs that sit between the muscle and bone to reduce friction). Commonly known as ‘Greater Tro-chanteric Pain Syndrome’. What you can do: Check first that your saddle height is correct (see below for our sug-gested method). Stretches will help to make your hip muscles more flexible, and seeking treatment from your Osteopath can relieve the tension and get your hip moving normally again. Symptoms: Pain or a deep ache around the kneecap. Can feel stiff when first getting up from sitting. Common Causes: An imbalance of muscles on the thigh or at the hip can sometimes lead to a change in balance of tension across the knee cap. This is known as ‘Patello femoral syndrome’. What you can do: Firstly, check the height of your saddle to make sure it is optimal for your height and not placing extra load on one group of muscles. Getting into a routine of hip and knee stretches can also help reduce tension over the knee cap and get things moving a better. Your local Osteopath can help to determine the cause of your knee pain and tailor exercises and stretches to the root cause of the problem. Over-training can also be a cause for knee pain, so if you are putting in some hard miles to work up to a sportive, make sure you are sequencing your training appropriately and having enough rest days. Symptoms: Pain focused around the outside of the kneecap, often accompanied with a feeling of tightness in the hip on the same side. Common Causes: The ‘IT’ (Ilio-Tibial) band is a length of fibrous tissue which runs from the hip to the outside of the knee and is an important area which many muscles blend in to. With repeated movement and decreased flexibility in the hip external rotators (particu-larly Gluteus Maximus) this can alter the muscle balance around the knee and create ten-sion on the outside of the knee cap leading to irritation of the knee cap. This can be the result of over training and incorrect saddle adjustment. What you can do: Take a look at the height of your saddle and check if it is too high or low. Adding some mobility and flexibility exercises to your post cycling routine can help reduce the build up of tension around the outside of your knee. Symptoms: Tenderness and pain underneath the knee cap on the front of the lower leg. Sore after riding and can be painful during the first few minutes of cycling. Common Causes: The patella tendon attaches the bottom of your kneecap to the top of your lower leg. 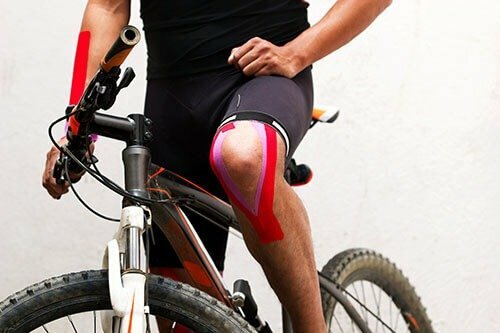 Although it is very strong and can handle the large amount of force that pass through it when extending the leg, it can become irritated when placed under too much demand, such as with over training or poor bike set up. What you can do: First thing is to continue riding but scale back on your training if possi-ble, and make sure you take adequate rest days. A program of stretching and exercises to help strengthen the tendon have shown to be most effective by research, these can be tai-lored to you by your Osteopath. Lastly, check the size of the frame and saddle height you are riding with to ensure your riding position is efficient. Common Causes: ‘Achilles tendonitis’, an overuse injury of the tendon which runs from the calf muscle to the back of the foot. Often the result of training too much too quickly, where the tendon becomes irritated from not allowing time adequate time between rides to strengthen. Bike set up can affect it too, if pedal cleats are set up too far forward and the saddle is too high, the ankle can be held in a pointed down (‘plantar flexed’) position which can place further tension on the achilles tendon. What you can do: Break up training to allow for adequate active rest and make sure the tendon gets enough healing time. Applying ice (wrapped in a towel for not longer than 5 minutes) can help with pain relief and then finally checking your saddle height and cleat placement are not placing too much load through your the back of the ankle. Symptoms: Pins and needles and/or with a loss of sensation in the foot (particularly the under surface), often after cycling for a short period, made worse by slow cadence and cy-cling up hills. Common Causes: Ill-fitting shoes or cleats placed too close to the toes can create tension across the metatarsals (the bones in your feet). This can compress the nerves in the foot leading to temporary numbness. Lots of hill climbing can also create more pressure on the foot and create further tension across the joints. What you can do: Check your shoe size and make sure they are a comfortable fit and not too tight. Additionally, having a good look at the placement of your pedal cleats and mak-ing sure that the pressure is directed to the ‘ball’ of your foot can help reduce tension across the metatarsals. If you have been riding lots of hills or training for a hill climb, try and vary some rides so to alleviate some pressure build up whilst out on the bike. Symptoms: A real pain the backside. Soreness between the contact area of your buttock and the saddle. Common Causes: Skin irritation from an increased in friction between the buttock and the saddle. Often from a poorly fitting saddle and old or inadequately padded cycling shorts. What you can do: Head to your local bike shop and try out some different saddles to see which one is a good fit. Double check your saddle height and angle to ensure you aren’t creating pressure points. If the saddle is angled too far upwards, it can increased the side to side movement in the pelvis increasing friction. Invest in a new pair of shorts and some chamois cream to reduce the build up of friction on the skin. Symptoms: Pain on the top of the shoulder around the tip. There can be a raised area above the joint where the capsule has been damaged. Common causes: Falling onto an outstretched hand from your bike can transmit the force through your arm up into your shoulder, where the joint capsule can be strained. What you can do: First point of call after any major trauma or fall with prolonged pain should be to consult a healthcare professional. Depending on the grade of the sprain with affect what can be done about it. This can range from manual therapy to surgery. The popular ‘heel-to pedal’ method will help you find the rough height you need to be com-fortable and efficient (but doesn’t adjust for all of the factors influencing saddle height like cleat placement etc). I. Having a wall to lean on, take a seat on your saddle then place your heel on the pedal. II. Rotate it backwards to reach the 6 o’clock position, where you knee should be com-pletely straight. III. If your knee is bent slightly, increase the height of your saddle slowly by altering it small amounts each time, until your knee is straight and you feel comfortable. You may find this helps with your overall bike fit and increase your pedalling efficiency too. What is the difference between an Osteopath and Chiropractor? The primary objective for both Osteopaths and Chiropractors is, most frequently, to relieve aches and pain. However, osteopaths also treat a broader range of functional problems, such as disorders of the respiratory or digestive systems. Both Osteopaths and Chiropractors treat more than just bones joints and soft tissues. By working with the nervous system and blood supply they are able to influence all of the bodies systems, making them capable of alleviating the symptoms of a number of diagnosed medical conditions, such as; asthma, stress, digestive disorders, period pain, migraine and many more. In many cases, patient experiences with osteopaths and Chiropractors will be very similar; however, there are some differences. When diagnosing patients, osteopaths and Chiropractors both use visual inspection (observation) and palpation (touch). Chiropractors frequently rely on more diagnostic procedures, such as X-rays, MRI scans, blood tests, and urine tests. Osteopaths tend to place more emphasis on the physical examination and will generally refer patients on for more diagnostic procedures if required. Would you like to know whats the difference Osteopathy, Physiotherapy and Chiropractic? Read our Ultimate Guide to Osteopathy, Physiotherapy and Chiropractic here!